Lee's Chocolate Houses,established in 1995. Products are made with Cadbury Chocolate and the two most popular houses have party mix lollies inside. We also do a house with Cadbury Roses chocolates inside or really large houses with both lollies and roses weighing in at approximatly 5 kg. There are plenty or different sizes and varieties available. We make them in milk, white and dark chocolate. As I have found over the past few years a lot of people are gluten intolerant so we have started doing Gluten free products with no additional cost. I would suggest people pre order for market pickups to avoid disappointment. We try to do all craft markets in November and December and we offer pick up from home. Our newest product is a HUGE sleigh and certainly has the "WOW" factor. 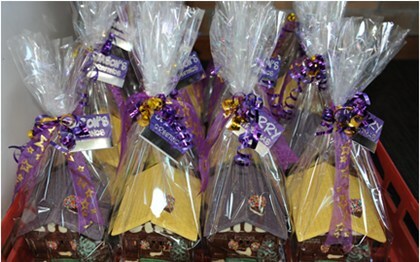 The houses are great gift ideas for teachers, friends, family or just for the chocoholic you know. They also make a great table centre piece and decoration for your own house. 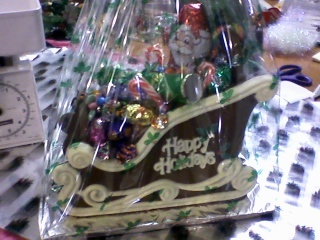 A lot of people have a tradition of a gingerbread house, well this is the same it's just Chocolate. They are very tolerent to the heat and humidity but they do need to be kept out of direct sun.They are sturdy and travel well. Large and small orders are welcome, we do try to keep our prices as low as possible as we are fully aware the cost of Christmas can be a strain. Hope to see and serve all the lovely regular customers and meeting new ones out at the Markets.